So….we’re doing soccer this year. L’s best friend kept coming over to the house on Saturday’s last spring in her soccer uniform so L asked to sign up this fall. I’ve never been a soccer fan…..at all…like not even tolerate it…I think it’s one of the most boring things in the world….but she wanted to play so I signed her up. The thing I’ve learned about U8 AYSO soccer is that games are mostly flossing and doing somersaults. The kids have fun but they’re not all that focused yet. L’s games get over right around lunch time so the last couple of weeks, we’ve been going out to lunch straight from the soccer complex. 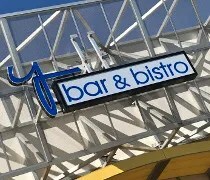 Y Bar & Bistro has been on my radar for quite some time. I’ve seen the advertisements for the Mac & Cheese bar but was always skeptical. 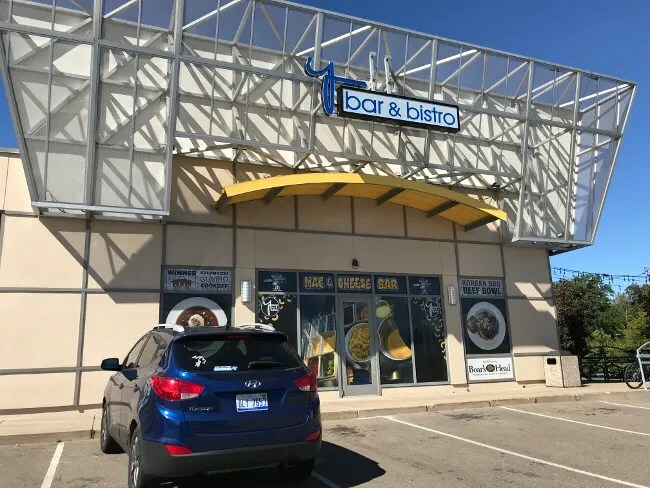 The restaurant is in the Campus Pointe Mall on the corner of Howard and Michigan where several other “college bars” have failed. The last one we went to in this location was AFB Bar & Grill. 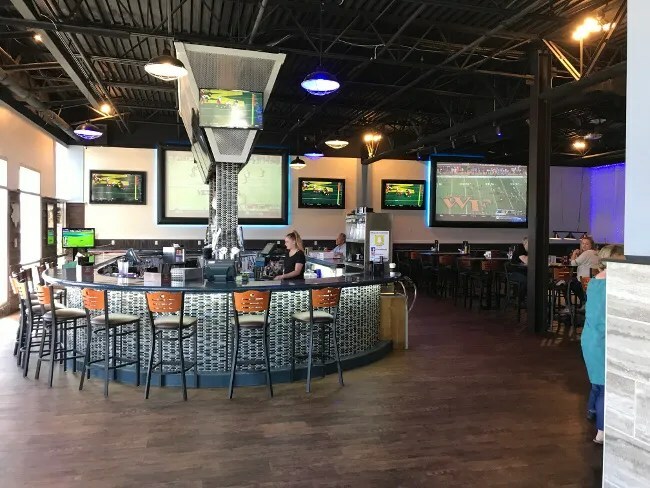 They tried to be a normal sports bar during the day but it still felt like we were out of place when we stopped in for lunch a couple of times. We got there not long after opening so we had the place to ourselves. 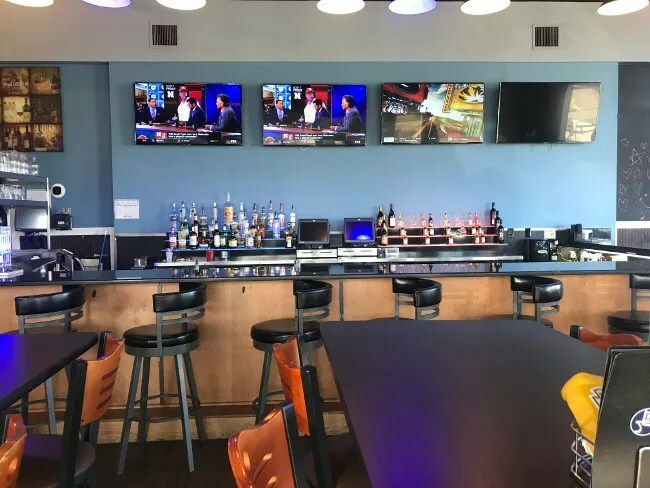 The restaurant is still set up the way it was when it was converted from two restaurants (Geno’s Golden Pizza and Pop’s Italian Beef) with a large bar and pub tables in the side that used to be the pizza place…. 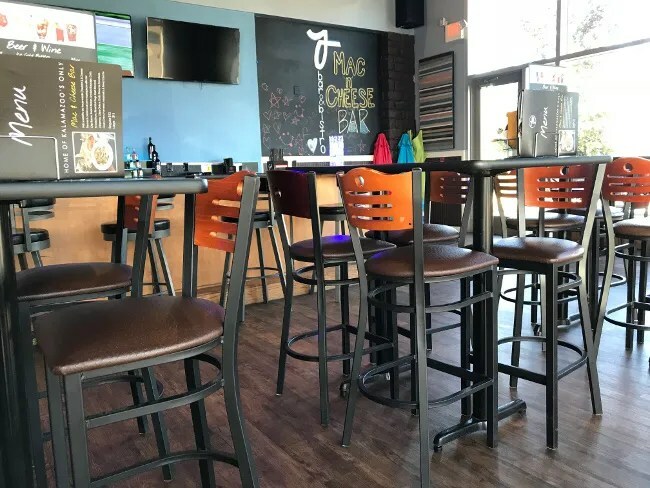 …and a smaller bar with a mix of pub tables and shorter tables in the side that used to be the beef place. We went to the smaller bar so the kids didn’t have to sit at the higher tables. A waitress/bartender followed us over to take drink orders. The menus were already on the table so we both looked it over quickly but utlimately just decided on Pepsi’s. We got the kid’s each a Kiddy Cocktail. They actually had small plastic cups for B which was surprising since we didn’t see, nor were offered a kid’s menu. The menu at Y Bar is interesting. Y Bar existed before they moved in to this space as a typical college bar in a building behind where they are now. They really stepped up when they moved to the bigger space in both the ambiance and as a bistro. The food comes off as typical pub food, but it’s not really that. There isn’t a long list of sandwiches, burgers, and fried appetizers. 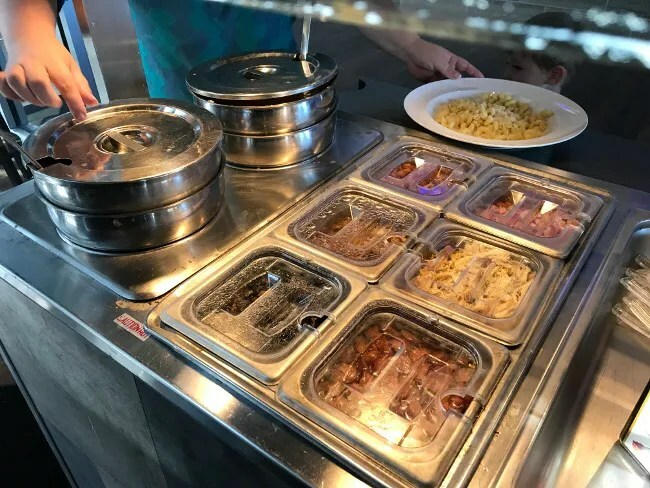 They do some ramen bowls, some entree bowls, a few sandwiches and salads and then their mac and cheese bar. There is a burger on the menu but I went somewhere different. I picked the Y Bar Beef Dip. 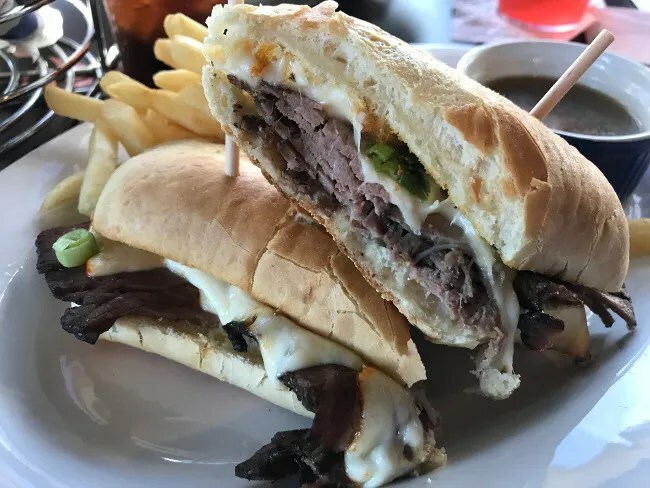 This sandwich is a crispy roll with Boars Head London Broil Roast Beef, scallions, cream cheese, muenster cheese, mozzarella cheese, and au jus for dipping. I started to just eat this without dipping it and realized how stupid I was. the crusty roll just soaked up all the flavor from the au just which intensified the beef flavor. Once the bread was softened the sandwich was super tender and insanely tasty. 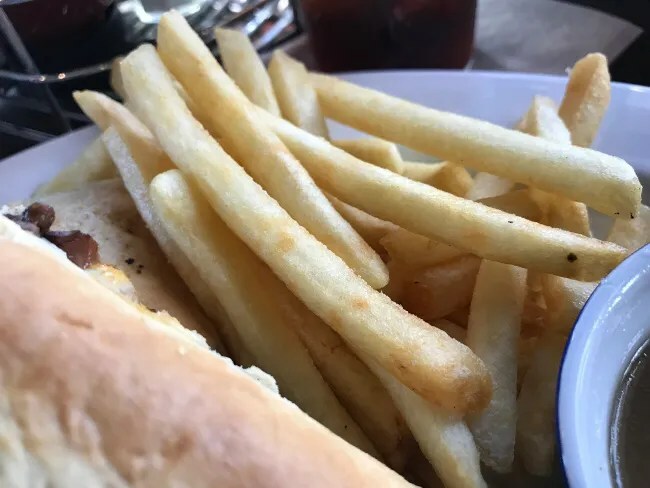 I got fries with my sandwich and they were nothing of significance. They were just another thing to dip in that beefy au jus. Without a kid’s menu, I was a little afraid on what we would do for B. We thought about just splitting a mac & cheese between the two kids but I noticed Chicken Tenders and Fries on the appetizer menu. B said he wanted that so that’s what we got him. 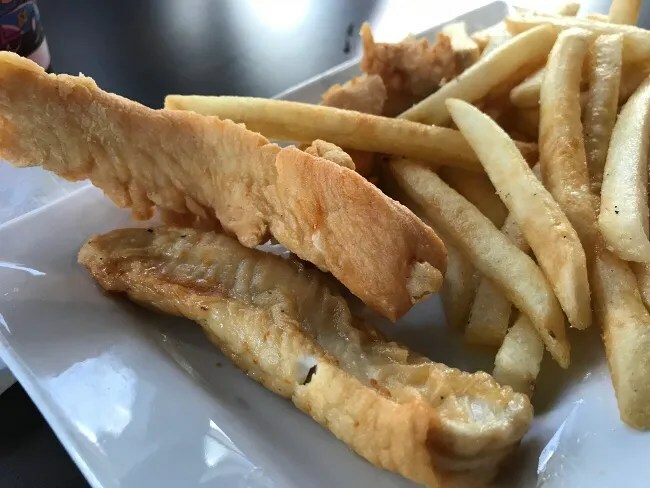 The tenders are hand battered strips on white meat chicken. I thought they were really good. A nice light batter on tender juicy chicken…but B was being a pain and didn’t want to eat. I ate one and he ate maybe a half of one. We boxed the rest up to go home while J and I finished off his fries. J and L both ordered the Mac and Cheese Bar. We got regular bowls for each of them. 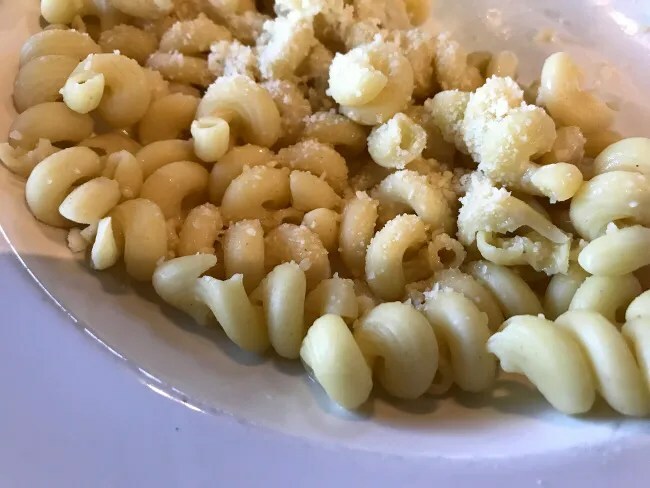 The pasta comes out plain with some Parmesan cheese sprinkled on top. There’s a toppings bar close to where we were sitting. 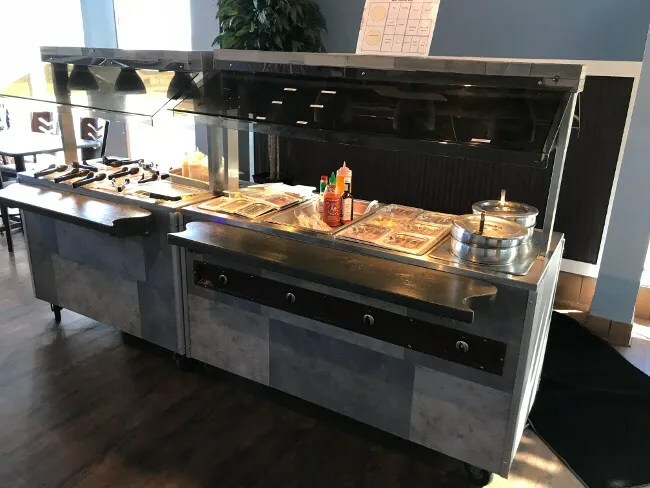 It looks and acts like a salad bar. You get your bowl of pasta and then you can top it anyway you like. 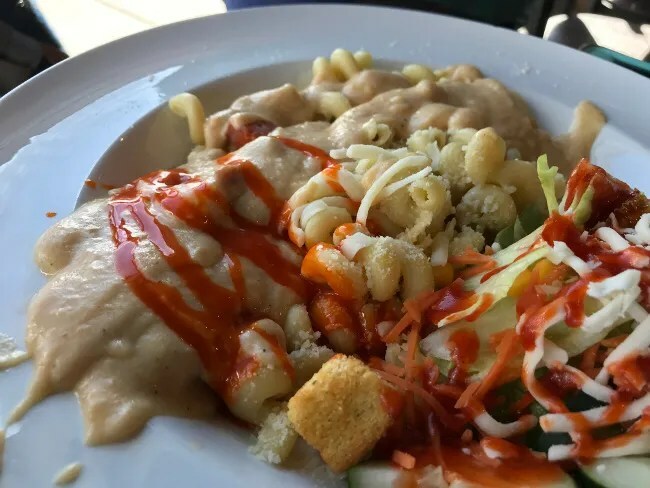 One side has the cheese sauces and a variety of meet toppings, hot sauces, and veggies to make your meal whatever you want it to be. The other side has a small salad bar. This worked out great for L. She wanted nothing on her noodles…just plain noodles with Parmesan cheese, but she has been a real big salad eater so she took advantage of that. She ended up not eating much of her noodles but ate a pretty big salad for lunch instead. J did things right and turned her bowl of mac and cheese into a Buffalo Mac & Cheese. She added on some cheese sauce and buffalo sauce to give it a little bit of a kick. She also did a little bit of a salad with hers as well. Our bill before tip was right around $53. Y Bar & Bistro was not the college bar I was somewhat expecting it to be. It may be after the sun goes down but until then, it’s a pretty solid sports pub. 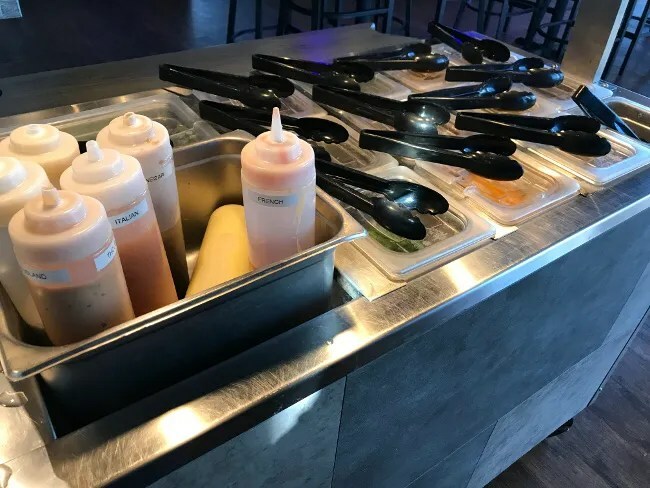 The mac and cheese bar is a unique concept and if you’re going to go crazy with the toppings, totally worth the price. The manager was around while we were eating and he was telling us they have added online ordering and delivery which could be quite amazing for us. My advice on this place is, don’t be like me. Don’t assume you know what Y Bar is based on this history of the location and the history of the name. This is a great spot for lunch or even dinner most nights before the Western kids show up.